Daniel Colson’s Little Philosophical Lexicon of Anarchism from Proudhon to Deleuze offers a rich philosophical resource for conceptualising anarchism. Colson shows that from the standpoint of anarchism there are ‘secret affinities’ between diverse thinkers – such as Simondon, Deleuze, Foucault, Whitehead or Nietzsche – that make them surprisingly close to each other and to anarchist ideas. One, perhaps rather unexpected, enlistment for ‘the anarchist cause’ is that of Gabriel Tarde (1843-1904). This French sociologist and criminologist, who admittedly had very little sympathy for anarchism, permeates the Lexicon and is marshalled to bolster various aspects of Colson’s philosophical take on anarchism. Here I would like to pick up on Colson’s reference to Tarde and develop it briefly with regard to contemporary anarchism in practice. One of Tarde’s key ideas is that of imitation. In his neo-Leibnizian Monadology and Sociology (1893), Tarde demonstrates how individuals are formed through a mimetic contagion. Not only do we copy – wittingly or unwittingly – other people’s behaviours in our bodily practices but, even more radically, we are possessed by others. Such a ‘reciprocal possession’ between individuals, as well as between individuals and institutions, is what, for Tarde, constitutes a fair society. In this context we could venture a thesis that the more reciprocal the possession is, the fairer the society becomes. Individuals in this framework are ‘resultants of a ceaseless process of individuation’ that is constituted by a bespoke collage of mimetic tropes that we pick up throughout our lives. Variations on this mimetic process of individuation, that are more or less explicitly inspired by Tarde, can be found in the works of contemporary thinkers including René Girard, Judith Butler or Peter Sloterdijk. Here, however, I would like to focus on imitation in anarchist collectives. Mimetic and monadological framework provides an insightful perspective on anarchist collectives. If we consider housing co-operatives and autonomous zones in particular, where spaces are inhabited together by activists, we can see that anarchists act on an intuition that humans are, first and foremost, mimetic beings. A tacit assumption of virtually all mimetic theories is that it is impossible for human beings not to imitate and so not to repeat an incorporated norm. Imitation is in this framework a modus operandi of existence. Members of housing co-op’s put themselves in an environment where they will inevitably imitate the behaviours of other co-op members. The process will happen both wittingly and unwittingly. That way they can determine a set of models for imitation – exposing themselves to political and social behavioural patterns that they aspire to incorporate in their own daily practices – and thus effectively shape their behaviour and modes of responses to various situations. One could go as far as to say that anarchist undertake a form of training in their co-ops. And these co-ops are forms of training camps in social transformation, realizing utopia here and now. Habits are established through repetition and so social transformation is a question of directing one’s mimesis. For anarchists this means directing it towards habits that improve the spheres we inhabit not only for ourselves but, more importantly, the spheres we share with other humans, animals, plants and the environment we are embedded in. This does not mean that mimetic incorporation happens explicitly or that it is only characteristic for anarchist collectives. However, anarchists pay close attention to the daily practices in their micro social structures as this is a way to permanently change the surrounding world. We could say that the tacit assumption here is that the change will happen through mimetic contagion. It will spread to other people through inspiration, supported by direct action and propaganda by the deed. Contemporary anarchism in practice is an effective form of harnessing mimesis towards a more habitable world. Both Tarde and Colson help us bring to the fore the inherently mimetic aspects of anarchism. See in particular Uri Gordon, Anarchy Alive! Anti-Authoritarian Politics from Practice to Theory (London and Ann Arbor, MI: Pluto Press, 2008). Cf. Gabriel Tarde, Monadology and Sociology, trans. and ed. Theo Lorenc (Melbourne: re.press, 2012), 51-57. This can be inferred from Tarde’s claims that ‘reciprocal possession’ is superior to ‘unilateral possession’. The examples of the latter he gives are ‘in ancient law [the possession] of the slave by the master, of the son by the father, or of the wife by the husband’ (Tarde 2012: 51). ‘Thanks to the development of civilisation, the possessed becomes more and more a possessor’ (Tarde 2012: 51). Possession in Tarde’s sense does not only refer to property (as both things someone owns and a characteristic) but also includes relations of influence and imitative contagion: ‘As a subscriber to a newspaper, I possess my journalists, who possess their subscribers’ (Tarde 2012: 52). Thus, Tarde uses the whole spectrum of the term ‘possession’, from acts of physical appropriation, through having a quality or characteristic to spiritual possession and hypnosis. Here I focus only on the mimetic aspects of possession in bodily practices. Daniel Colson, A Little Philosophical Lexicon of Anarchism from Proudhon to Deleuze, trans. Jesse Cohn (Colchester at al. : Minor Compositions, 2019), 121. This would be referred to as ‘citationality’ or ‘iterability’ in a Derridean framework. See, notably, Jacques Derrida, ‘Signature Event Context’, in Gerald Graff, ed., Limited Inc. (Evanston, IL: Northwestern University Press, 1988), 1–23; Judith Butler, Excitable Speech: A Politics of the Performative (New York and London: Routledge, 1997). Think about monasteries, schools or armies that actualize similar intuition. However, as I argue elsewhere, the defining characteristic of anarchist collectives is ‘solidarity with singularity’ that makes them different to those other formations. 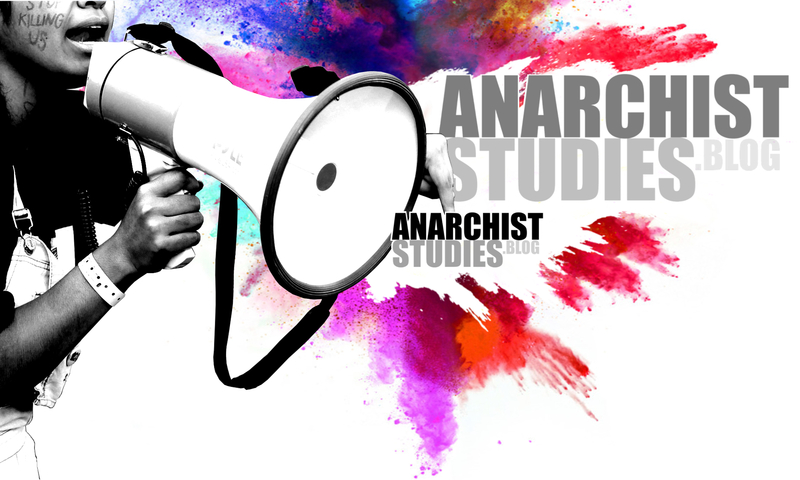 For more detail see Janicka, Theorizing Contemporary Anarchism.